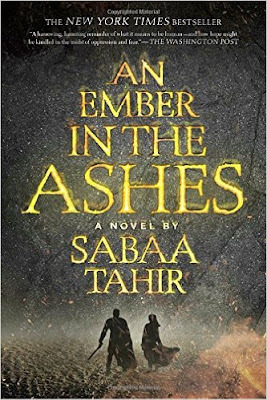 Sabaa Tahir’s An Ember in the Ashes was released in 2015 – so it’s not a new book and I realize that I’m a little late to the party. But, as they say, better late than never and I’m so glad I showed up. Seriously, I will party with Sabaa Tahir all day. Weakness is akin to death in the Martial Empire and anyone who runs or challenges the Empire will surely lose his life to public execution, torture – or worse. In an Empire dominated by fierce and bloody Martial rule, Elias wants one thing – to get away from the brutality and violence that surrounds him. He is the top of his class at Blackcliff Academy – a ruthless Martial school that trains its students to serve the Empire as its soldiers – where his skills have been honed and sharpened to serve the Empire, which is the last thing he wants. Laia is a Scholar girl who wants nothing more than to have her family back. Oppressed and held captive as slaves by the Martials, the Scholars once ruled their lands in wisdom and knowledge. Now seen as an inferior race, they fear enslavement by the merciless Martials who sweep them from their homes and families in the night. Having lost her family to the Martials, Laia is determined to find and save her brother who is captured by masked soldiers and held in a Martial prison – for he has secrets that the Scholar Rebels could use to finally fight back against their Martial oppressors and ultimately win their freedom. Seeking a way to free her brother, Laia joins the Scholar Rebel forces and becomes a spy in the most dangerous place in the Empire – Blackcliff Military Academy, where she is a house slave to the Commandant, a soulless and ruthless woman who lives in darkness and rules in terror over Blackcliff’s inhabitants. Within Blackcliff’s terrible walls, Laia and Elias find each other – both searching for their own version of freedom and finding their lives intertwined with great consequences. You guys – this book! An Ember in the Ashes was an epic fantasy thriller (the first in a FOUR book series) filled with betrayal, bloody battles, love, friendship, magic and so much angst. It was brilliant and I don't care what anybody says - I loved it. My favorite books usually are emotional rollercoasters that have me totally invested in the world and the characters that inhabit them (regardless of the genre). An Ember in the Ashes checked all the boxes for me and left me needing more. Flawed and relatable characters? Check. Evil, terrifying, hellbitch villain? Check. Maybe a little romance? Check. This book had it all and I loved it. I believe that truly talented writers are able to convey complex emotions in their characters and develop multifaceted relationships as they simultaneously shape the world around them without being pretentious or trite. Sabaa Tahir’s characters in An Ember in the Ashes are complex, relatable and flawed – which gives the reader all the more reason to invest in their wellbeing. I was completely invested in Laia and Elias’ success – which made this a great book for me. Aside from the characters, there are many elements at play in this novel. This book highlights the social injustices of the Martial Empire, it is political, and includes magical/supernatural elements in the form of the Augurs (mysterious, prophetic, holy men) and a myriad of other demons. It is truly a terrifying world where anything can happen, and often does which adds the intensity of the plot and character narratives. My only complaint would be the time it takes to get into the thick of the plot. Elias and Laia narrate in alternating chapters, which causes the reader to take a while to get to the main plot. It took me about a quarter of the book to get wrapped up in the events taking place – but it was worth it. If you like fantasy or dystopia that is intelligently written with characters that leap off the page at you, you’ll want to pick this up. And if you are not totally 100% sure you will like it – do it so you can read A Torch Against the Night – because it gets better!